The very name of "Koftas" gives a feeling of a dish that is very rich and heavy. But what about a kofta recipe that is not heavy for your tummy and still finger licking good. 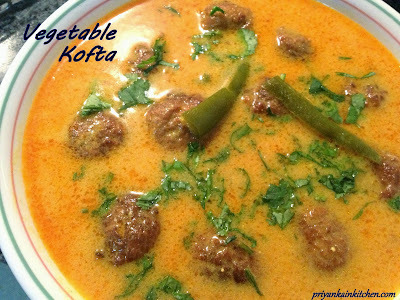 In this kofta recipe, instead of making the usual gravu of onions and tomato, I have made a gravy of yogurt. The flavor of yogurt along with key spices, takes it to a whole new level. Mix all the ingredients except oil in bowl to make a thick batter. Now make small balls of batter squeezing out any excess juice gently as shown in figure below. Remember not to squeeze out completely as that will make the "koftas" hard. Heat oil in a pan and fry these koftas on medium heat, till they turn golden brown as shown in picture. Mix 2 cups of water in the bowl with squeezed out juice. Add turmeric and chili powder to it. Heat oil in pan, add asafoetida and cumin seeds. When cumin seeds crackle, add the water and juice mixture to it. Add coriander powder and bring it to boil. Now slowly add whisked yogurt, stirring continuously. Stir until it boils. Adjust the consistency of gravy as required. Refer picture for it. Add slit green chilies, salt , koftas and let it cook for 2 mins on low heat. Garnish with chopped coriander and enjoy with your choice of bread. Tip: If you are cooking this ahead of meal, just prepare the gravy and add the koftas right before serving and give a boil. Leaving the "Koftas" for long in gravy might break them.